Replacing pedal and slot felts. Inspecting and adjusting pedal rod length. Inspecting the base, pedal springs, and pedal levers, strings, nuts, and discs, and making any necessary repairs. Inspecting and adjusting string alignment. Eliminating or controlling unwanted noise. Adjusting intonation in natural and sharp pedal positions. On a lever harp, regulation typically involves inspecting the harp for any necessary repairs, tightening tuning pins and lever screws, eliminating or controlling unwanted noises, and optimizing the intonation between the lever-up and lever-down positions. For more on regulation, check my article, What is a Harp Regulation Anyway? Help! I broke a string! How do I replace it? Some string breakage is inevitable in the life of any harpist. Learning how to replace broken strings is as important as learning your scales and repertoire. Ideally, having someone demonstrate the various procedures in person for you is the best way to learn. Trying to copy a drawing or a diagram printed on your string package is probably the worst (at least it is for me!). Failing a live teacher, the Internet has a wealth of videos showing the knot-tying process. You can find some of mine on my Other Videos page. 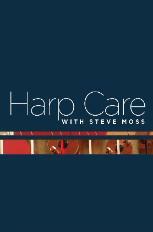 For the most detailed demonstration I know of, check out my DVD, Harp Care with Steve Moss. How often should my harp be regulated? In general, a harp should be regulated every one to two years, depending on how often it is played. Many professional harpists have their instruments regulated every year. Beginning students can go two years or more before their instruments need regulation. Lever harps do not need regulation nearly as often as pedal harps do. I suggest having a lever harp regulated every five years, assuming you aren’t having any problems with it. Periodic regulation can nip any looming problems in the bud before they show up during your big concert. Can you perform my free warranty regulation? Lyon & Healy and Salvi offer a free regulation on new pedal harps after the first year of ownership. I am authorized to perform these, but I do need to clear it with the manufacturer ahead of time. Please let me know if you are due for a warranty regulation when you arrange the appointment. A harp is only as good as the strings you play it with. I have heard $15,000 harps that sounded like $15 toys because all of their strings were worn and false. I recommend replacing the strings in the first and second octaves once a year. Worn strings in these octaves will make a harp sound like it needs regulation even when it doesn’t. Replace the bass wires every two years if possible. Old bass wires loose their sustain and eventually start to sound like slack rubber bands if you leave them on long enough. Since your bass wires will ring sympathetically even when you are playing in the upper register, a nice new set of bass wires make your entire harp sound richer. The strings in the third, fourth and fifth octaves can last longer. Inspect them periodically for wear where they contact the discs or levers, and in the area where your fingers touch them. Replace them as they wear and fray in these areas. Can you restring my harp at my regulation appointment? It is difficult to regulate a newly restrung harp, as the new strings won’t hold pitch long enough to check the intonation. Ideally, new strings should be on the harp for a week or two before regulation. If I am only in your town for a few days, you can still have the harp restrung if we arrange it ahead of time. I will change the strings during the early part of my visit, tune them frequently, then regulate your harp toward the end of my stay. How do I keep my harp clean? Wash your hands before handling your instrument. Dust your harp off frequently using a soft cloth made for musical instruments. Dust out the front of the mechanism with a soft stencil brush. On modern harps it is okay to use a damp rag to clean smudged areas. Let dry and polish with a clean cloth. You can polish your harp periodically, but I don’t recommend doing so more than once or twice a year.Check with your harp’s manufacturer to see what polish they recommend for the type of finish on your harp. Do you do insurance appraisals? Yes. I can perform an inspection of your harp and give you a written letter for your insurance company outlining its condition and providing an estimate of its current market value. I cannot guarantee the accuracy of any estimate. As the harp market is unregulated and no sales data are available, it is nearly impossible to accurately pinpoint a harp’s current market value. The best I can do for you and your insurance provider is to make an educated guess. I want to sell my harp. Can you tell me how much it is worth? I cannot give an assessment of a harp’s approximate value without inspecting it in person. There are too many variables: age, condition, amount of wear on the moving parts, etc. Also, there is no “harp blue book” or other reference material available to help evaluate harps based on model and age. That being said, I do try to advise my customers as much as possible if they are thinking of selling a harp. I am happy to inspect it and point out any possible repair issues that could affect its value. If I’ve had a chance to take a good look at a harp, I’m happy to advise customers on a reasonable asking price based on my experience and anecdotal knowledge of recent harp sales. My F string above Middle C broke. What octave is that? Pedal harp strings have a unique numbering system. Octaves are named in groups running from F to E (low to high). Octave numbers go up as they go lower in pitch. Middle C is 4th Octave C. The C an octave below Middle C is 5th Octave C. The E above Middle C is 4th Octave E. Since a new octave begins at F, and the octave number gets lower as pitch goes higher, the F above Middle C is 3rd Octave F.
What are harp strings made of? Three different materials are commonly used for harp strings: Wire, gut, and nylon. Wires are found on the lowest notes of the majority of harps. Some Celtic harps are completely wire-strung. Most bass wires consist of a bronze or steel core wrapped with a coil of thinner metal, which can be nickel-plated brass, plain brass, silver, or copper. Completely wire-strung harps have plain (unwound) wire strings as well. Gut strings are made of intestinal fibers, most commonly those of sheep or cows. The fibers are twisted together tightly and coated with a finish. Most pedal harps and a small number of lever harps use gut strings over much or their range. Nylon strings are made of, well, nylon. The majority of folk and Celtic harps are strung mostly or entirely in nylon. On pedal harps, the top one or two octaves are generaly strung in nylon. Nylon strings can be used in place of gut in most cases, though the sound quality is frequently not as good. The reverse is not necessarily true. If your harp is strung in nylon, check with the manufacturer before switching to gut, which has a higher tension and can damage a harp that was not built to accommodate it. Gut strings are so expensive! Can I use nylon instead? You can, though you may be disappointed in the way your harp sounds. There is a difference in sound quality that becomes more and more pronounced in the harp’s lower registers. In general, I think nylon strings are advantageous in some octaves, and detrimental in others. Let’s take each octave in turn. In the harp’s first octave, there is relatively little difference between gut and nylon strings in terms of sound. Most new pedal harps are strung in nylon, and most harpists continue to string the first octave in nylon. First octave gut strings are available, and some people prefer their tone and feel, though they are prone to breakage. Second octave nylon strings have a brighter sound than their gut counterparts. Some orchestra players feel that they project better than gut in an ensemble setting. They are worth experimenting with for all harpists who would like to save money on strings. It is a little harder to play in tune with nylon strings in the second octave, since their greater elasticity means their pitch can change depending on how hard they are played. However, depending on your playing style this may not be a noticeable issue. In the third, fourth, and fifth octaves, I do not recommend using nylon strings. While they are perfectly safe to use, they lose tone quality and projection the lower you go. Since they are more elastic (or “stretchy”) than gut strings, some of their energy is lost when they are played, and they simply don’t produce as much sound, nor as rich a sound. In my opinion, nylon strings in the fourth and fifth octaves sound little better than stringing your harp with rubber bands. There are certainly situations where cost savings are more important than tone. A harp for a beginning student might be strung in nylon, as might a harp in a school system which has extreme budget constraints. In general, though, with strings, you get what you pay for, and investing in quality gut strings (assuming that is what your harp was built for) is often well worth the additional expense. Someone told me I need to replace my bass wires before a regulation. Is that true? No. I think this confusion arose because it is common practice to ask your technician to replace your bass wires during a regulation, both because new bass wires improve the harp’s sound, and because many harpists don’t feel comfortable replacing their own wires. While I highly recommend having your bass wires replaced AT a regulation if finances allow, it is not absolutely necessary. It is certainly not necessary for you to do it prior to the regulation. Someone told me I need to restring my whole harp before a regulation. Is that true? No. Completely restringing your harp before a regulation is not required. However, I do recommend restringing the first and second octaves about two weeks prior to a regulation. Why do you recommend replacing the top two octaves of strings before a regulation? I recommend replacing the top two octaves about two weeks before a regulation because they are the most subject to intonation problems due to wear. As harp strings are played, they gradually develop indentations where the discs in the mechanism engage them. As the indentations get deeper over time, the harp disc displaces the string less and less. In a lower string, the effect of this wear is small compared to the length of the string, and may not result in any problems. In the first and second octaves, however, where the strings are shorter, any change can result in an audible change in intonation. This is one reason harps seem to go out of tune as they’re played over time. While a regulation can adjust for the wear on the strings, the wear will continue once it has begun, and the intonation will slip again. Then, when the worn string breaks and is replaced, the new string may well be out of tune as well, since the harp’s discs and nut were set up to accommodate the worn string. Thus, to get the most accurate regulation that will last the longest, it is best to have new strings in these top two octaves. Why must the strings be changed in advance? Can't it be done at the regulation? Replacing strings and regulating a harp at the same time is a double-edged sword. While it’s great that the strings are new and not worn or pitted, it is very difficult to get them to stay in tune long enough to check the intonation during the regulation. Ideally strings should be replaced and tuned frequently in advance of the regulation so that they will hold their tune long enough to accurately regulate the harp. If you are really uncomfortable about replacing your own strings, it is often possible to arrange to have me do it at a regulation if you can leave the harp for a longer time, such as overnight. In that case, I can replace the strings one day, tune the harp several times, then regulate it the next. How do I replace a bass wire? I would like to take harp lessons. How do I find a good teacher? Finding a good harp teacher in your area can be a challenge if you’re new to the instrument. It’s not as if you run into a harpist every time you cross the street. If there’s a symphony orchestra in your area, ask if they have a harpist. If there’s a University music department close by, there may be a harpist who teaches there. Even if these harpists don’t teach or are two busy, they will be able to refer you to other teachers in your area. If you have friends who hired a harpist for their wedding or other function, you can ask for her contact information. Same thing if you know other professionals who work in the wedding insdustry, such as caterers and photographers. There is frequently a local Chapter of the American Harp Society, and many chapters have a local email list for sharing information. If you keep asking, you should be able to get in touch with someone who can clue you in on your local harp scene. For more on this, see my blog post, So, You Want to Take Harp Lessons. I want to buy a used harp. Do you have any advice? There is a lot to think about when looking around for a good used harp. Is the one you’re looking at a good deal? How do you know if there’s something wrong “under the hood?” I have written a six-part series of blog posts covering this issue. You can find the first part at Used Harps: Can You Find a Good Buy? Is it possible to rent a harp? Yes. Harp teachers often have beginner-level harps available for their students to rent. Some harp dealers and manufacturers offer rent-to-own programs as well. For more information, check my blog post, How to Find a Harp for Rent. How do I tune my harp? You keep talking about "intonation." What do you mean by that? In terms of the harp, by “intonation” I’m referring to the relationships of the pitches which the harpist obtains by moving the pedals or levers. In other words, if you get a string perfectly in tune with the pedal in the flat position, then you move the pedal to the natural position and play the same string again, is the new pitch exactly one half-step, or semitone, higher than the original pitch? What about the third pitch when the pedal is moved to the sharp position? If these relationships are exactly correct, you can say that string has perfect intonation. In the real world of music, things are rarely perfect, but we strive to get as close as possible. Optimizing this relationship between the different pedal positions is a major step in performing a regulation. The goal is for the harpist to be able to play in any key and sound in tune without having to retune the harp. Someone told me I have to tune the harp with all the pedals in the flat position. Why can't I just tune in C Major? It is true that you get the most accurate and stable tuning if you tune your harp in all flats. Why? Because when no discs or levers are engaged, you minimize the amount of friction along the length of the string. Say you’re tuning a string with a disc engaged, such as a C Natural instead of a C flat. As you turn the tuning pin to increase tension on the string and raise the pitch, some of this increased tension gets trapped between the two pins of the disc. In other words, the friction caused by pulling the string through the “z” shaped twist applied by the disc results in the tension being distributed unevenly across the length of the string. Now, all may sound fine at first, but that displaced tension around the disc pins will dissipate over time, causing the pitch to go flat. If you release the disc to play an accidental, that uneven tension will be released all at once, causing the string to slacken all at once and go out of tune more quickly. I this is confusing, I apologize. It’s difficult to describe in writing. But trust me, you want to eliminate as much friction as possible along the length of the string when you tune. I am trying to tune my harp in all flats, but my tuner only displays naturals and sharps. Now what? Yes, my tuner does that too. The solution involves understanding the musical concept of enharmonic equivalents. Musical notes can have more than one name, depending on their context. for instance, a C Sharp and a D flat are functionally the same pitch in modern music. The choice about what to call them involves the key the music is played in. I go into more detail on this in the tuning excerpts from my DVD, Harp Care with Steve Moss. I also have a tuning chart you can download which accompanies this section of the DVD and helps you remember the enharmonic equivalents.